So I eventually took a deep breath, put on my nice black dress pants, and went to church. I parked, walked up to the doors, and very nearly turned around to go home and put on a skirt. What was I thinking? What would it prove? But, being pretty late to church as it was, I took another deep breath, and walked in. As I moved through the halls to get to class, I started to panic. I saw a sea of ladies in skirts. No pants, no purple. But no one even seemed to notice me walk in. I hadn't done a terrible thing. I hadn't overturned years of tradition. I was just a woman walking in the halls. In pants. No one noticed the pants, or if they did, they didn't care. I went to class, where no one said anything and the teacher was pleased to see me. I went to sacrament meeting and was approached by the Relief Society President. I was startled only for a moment when she handed me a small Christmas present and asked how preparation is going for the move. At the end of sacrament meeting, my pants and I strode up confidently to the Bishop to hand him my tithing envelope and thank him for running a great ward, this being my last Sunday here. Then I worked my way back out to the car and was stopped by two or three ladies on my way out who wanted to say hi and that they'd miss me. Not one comment, not one funny look. Nothing was different, but somehow it is. 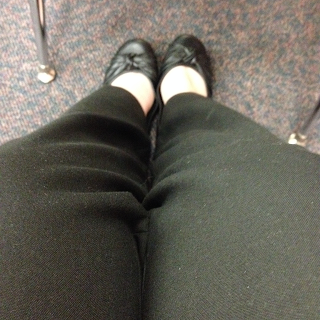 I wore pants to church--my Sunday best slacks--and I feel pretty good about it. Just kidding :) But obviously Eliot came to mind when I read your post. There's a sparseness and a simplicity to your experience that is reflected perfectly in the way that you write about it. I attended the American Academy of Religion conference in Baltimore at the end of November. It's the largest national conference for religious studies and there was a panel convened by the Mormon Studies group and the Women and Religion group. One of my favorite moments was when some of the panelists reflected on the notion that "well-behaved women rarely make history" but that how that's partly because of the tools and ideological interests of history and historiography itself and not just a straightforward gender bias. In other words, it's not just that history overlooks women, but that history has predominantly been interested in the movers and shakers, the people that change things. But with the advent of social history and newer waves of women's history, some of those historiographic approaches and assumptions are challenged. So the panel reflected on the challenge--how do you write a history of well-behaved women? Women who exercise agency, but in a way that operates in accordance with other systems. Something about the form of this blog post--as well as its content--just made me think about that. And that the end of a world or an epistemology might not be with the bang, but with the whimper.